A classic folding stick. The ash derby handle has been scorched to bring out the interesting pattern of the grain. The shape of the handle offers excellent support to the hand and may be hooked over the arm when not in use. 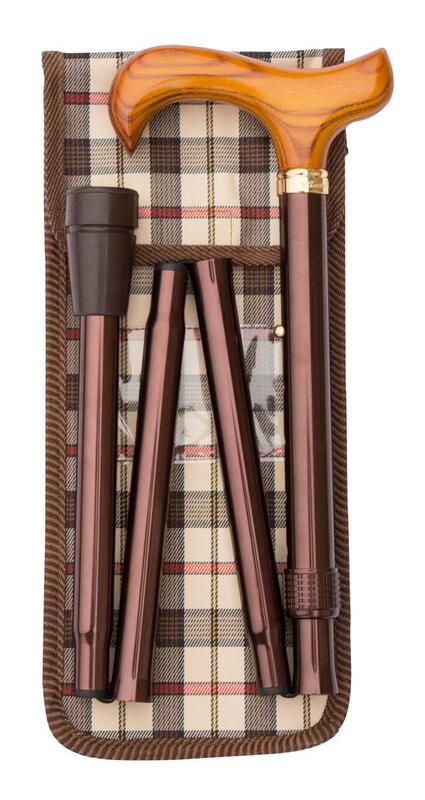 The strong and light aluminium shaft is painted a smart metallic coffee brown and folds into four sections. It is height adjustable from 82 to 92cm (approximately 32"-36") in 2.5cm increments. Overall length when folded is 34cm approx (13.5"). 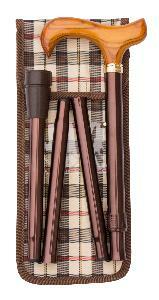 A smart carrying wallet is included, in a cream, red and brown check with smart brown piping. It also features a belt loop and an external clear plastic pocket in which the owner's name and address may be displayed.